The physical development and ecosystem health of river deltas in cold regions are strongly controlled by ice processes and thus are highly susceptible to the effects of climate change. As an example, the photograph shows a typical lake/pond and river network in the Peace-Athabasca Delta (Canada), one of the largest freshwater deltas in the world. 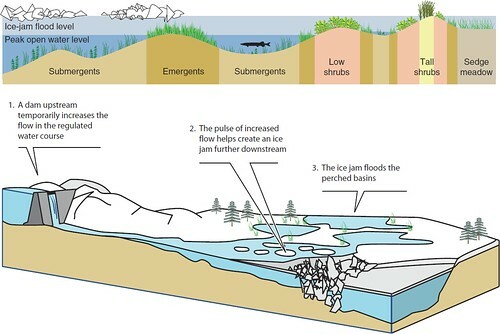 The water budget and sediment-nutrient supply for the multitude of lakes and ponds that dot the riparian zones of such deltas depend strongly on the supply of floodwaters produced by river-ice jams during the spring. These spring floods usually exceed those from open-water flow events, as illustrated in the top figure. Studies of future climate conditions for the Peace-Athabasca Delta indicate that a combination of thinner river ice and reduced spring runoff, due to smaller winter snowpack, will lead to decreased ice-jam flooding. This, combined with greater summer evaporation from warmer temperatures, will cause a decline in delta- pond water levels. An adaptation strategy that has been successfully used to counteract the effects of climatic drying of delta ponds involves the use of flow enhancement through water releases from reservoirs. This increases the probability of ice-jam formation and related flooding of the delta ponds (see bottom figure).